Meyer-Bäumer, A. / Körner, G.
After the successful conclusion of periodontal therapy, the dentist is often confronted with a situation that the patient regards as aesthetically unsatisfactory. This can be observed especially in cases where there is substantial loss of attachment, as in patients with severe forms of chronic and aggressive periodontitis. Aesthetic reconstruction of lost hard and soft tissue structures and possibly of lost teeth in patients with periodontal disease is one of the greatest challenges in dentistry. Numerous very different options are available for this reconstruction: these can be subdivided into purely prosthetic (replacement) measures and combined prosthetic and plastic and periodontal surgery measures. The article gives an overview of the wide range of possible periprosthetic treatments. The author has been a pilot user of the hybrid ceramic VITA ENAMIC since 2011. The product has now proved successful in office chairside treatments. The positive results achieved by VITA ENAMIC in studies were confirmed in routine clinical practice. Thanks to its very good workability, highquality and aesthetically convincing results can be obtained easily and within a very short time. As always, a wealth of experience and the skilled practitioner's trained eye are advantages. Pelekanos, S. / Vlachopoulos, N. / Varvatakos, D.
Implant-supported single-tooth restorations in the anterior region may be regarded as the supreme discipline of esthetic dentistry. A lithium disilicate CAD/CAM block with a premanufactured connection geometry that fits the titanium base significantly facilitates the prosthetic procedure. This patient case demonstrates the manufacture of a tailor-made lithium disilicate hybrid abutment (IPS e-max CAD Abutment Solutions) for use in conjunction with an all-ceramic crown. The objective of this practice-related study was to investigate the performance of the DENTAL RATIO Implant System in heavy smokers with over 20 cigarettes per day. Non-smokers were used as control group. Two implants did not show primary stability in the smoker group which equals a failure rate of 5 %. All implants were osseointegrated in the non-smoker group. There were no significant differences in age and gender of the patients. From a relative point of view, the loss rate of 5% shows that smokers can certainly be provided with implants as long as an appropriate strict protocol is adhered to. Green dentistry is a choice made by the dentist to practice his craft in a manner that lowers the impact of the dental practice on the environment. Dentistry is a "dirty" industry with a high usage of disposable materials that have a negative effect on the habitants, environment and earth. By practicing green dentistry, we are making a commitment to minimize waste and the carbon footprint of our practice. The following procedures should be adopted in our clinics to be as "green dentists": 1) Reducing of waste and pollution. 2) Saving of water, energy and money. 3) Using of high-tech in our practice. 4) Supporting of wellness lifestyle. A 32-year-old female patient presented at our dental practice complaining of painful sensitivity in certain teeth after these teeth had been treated with composite restorations. 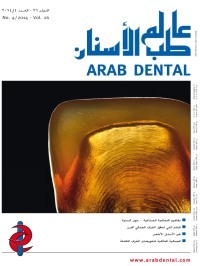 Clinical and radiological examinations and the vitality test reported some composite and amalgam restorations which were visibly not sealed and displayed secondary caries. The decision was taken to renew these fillings. However, as it is not possible to make a conclusive assessment of the pulp in the case of teeth with pain symptoms, we decided on a temporary restoration of the cavity with the glass ionomer restorative IonoStar Molar (VOCO) followed by a 40-day monitoring period. More than 20 years ago Torabinejad et al. (1993) described first a new root end filling material called mineral trioxide aggregate (MTA). Vital pulp therapy has become more popular in recent years. Calciumhydroxid has been the most common material for pulp capping but MTA showed even better results in biocompatibility and outcome. The material showed in vitro better sealing ability than amalgam or Super EBA when used as root end filling material. Later several in vivo and in vitro studies showed more application procedures for MTA. The mandibular nerve leaves the cranial cavity through the foramen ovale and, after giving off the mylohyoid nerve, a peripheral motor nerve that innervates the muscles of mastication, becomes the inferior alveolar nerve. If it is suspected that the nerve is being continuously compressed from without, e.g., by a root remnant, hyperostosis, an implant or suture material, the cause should be removed surgically. If complete division of the nerve as a result of a surgical procedure is suspected, microsurgical nerve approximation (neuroplasty) or nerve transplantation is indicated. Thoma, D. S. / Fehmer, V.
To fabricate a full denture that is flawless aesthetically and functionally, one thing is needed above all: a concept that proves its worth in routine practice. The author presents a working method that simplifies full denture fabrication and still meets aesthetic and functional demands. The goal of restorative dentistry has always been to create restorations that offer both functionality and esthetics. However, over the last 20 years, expectations in this regard have changed, with issues relating to esthetic and cosmetic "optimization" and the desire for a flawless appearance and absolute perfection increasingly becoming the focus of treatment. As a result, dental surgeons and dental technicians today are faced with the considerable task of not just restoring the functionality of the patient's dentition, but of also delivering highly esthetic everyday solutions that do not impact on patient health. The following real-life case study presents important preparatory steps, which, in addition to expert custom veneering, are critical to the success of quality anterior restorations. For intensive use in the office or for a few days at home - both methods are possible with bleaching by means of the 6% hydrogen peroxide lacquer VivaStyle Paint On Plus (Ivoclar Vivadent). How this bleaching system functions in detail and why a splint can be omitted can be read below.